When reading of the Amish buggy accidents that seem to happen so frequently (a second Amish woman died Wednesday following last week’s accident in Ashland County, Ohio), my thoughts eventually but inevitably go to the vehicle driver. Hard to fathom what it must be like to have someone’s soul on your conscience, even in a situation where you’re not at fault. Of course, if it turns out drugs or alcohol are involved, it’s harder to feel sorry for that person. Regardless, the burden of having taken someone’s life doing something as commonplace as driving a car – I wouldn’t wish that upon my enemies. The Amish are well-known for practicing forgiveness of those who do them harm. This was most famously demonstrated following the 2006 Nickel Mines Amish School shooting. Amish publicly expressed forgiveness of the shooter, a local milk truck driver, within 48 hours of ten of their daughters being shot (five fatally). 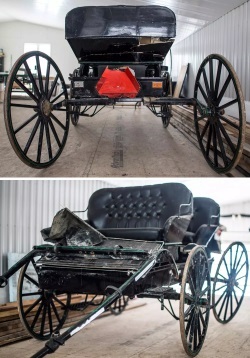 Canada’s National Post shares another tale of Amish forgiveness, this time involving an 18-year-old driver who, apparently blinded by early-morning sunlight, struck a horse-drawn Amish carriage one Sunday in January. 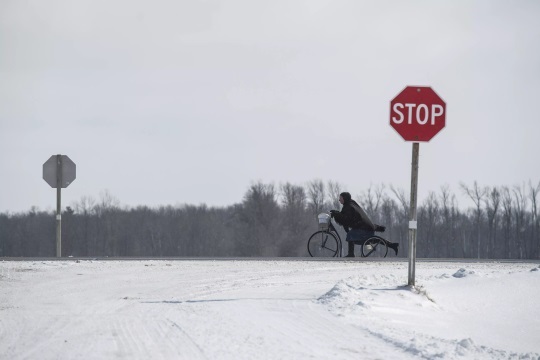 The four passengers, of the Milverton, Ontario Amish community, were ejected, with 74-year-old grandfather of 27, David Kuepfer, dying of his injuries. Jake Edmiston at the National Post investigated the aftermath, interviewing both the driver and her family, as well as the family of the Amish victim. The result is a remarkably candid and moving story of what has happened since. He doesn’t remember hearing Vanessa Martin’s blue Beetle coming up behind them, which seems odd because it’s a sound he’s especially attuned to. But it doesn’t much matter anymore; Paul and his family were worried about Vanessa. The Ontario Provincial Police charged Vanessa Martin with careless driving, an offence under the Highway Traffic Act, not a criminal charge. She is to appear in provincial offences court on March 14. After the funeral, Vanessa Martin’s mom brought Paul and Velma a chicken noodle casserole and some chocolate chip cookies. She knew what the couple and their family had done for her daughter, knew how their little gestures had eased a desperately hard situation. Wagler didn’t talk a lot. His answers were shortest when asked about forgiveness, about the small gestures in the aftermath that made things a little easier for Vanessa Martin. It was as if to him that was the most normal part of the whole ordeal. Knowing how Amish respond to tragedy, with their sense of “all in God’s time,” and “this was supposed to happen” — as Amish church members told Vanessa at the scene of the accident — this is unsurprising. But moving nonetheless. Beautiful stories. I don’t understand how they can believe that the car accident was supposed to happen. Was it because of the blinding sun? I’ve heard that many Amish believe that anything that happens is God’s will, but we know that isn’t true just looking at the Bible. I’m not sure I’ll ever understand. My heart goes out to both sides… I can only imagine the pain they all feel. How devastating to have been involved in such an accident. In why the car and buggy accident was suppose to happen reminds me of a religious course I took. Our teacher was saying that God sees all good times and bad times. He foresees things like accidents. I hope I can put as she did. There is a mountain with a one lane road. There is a car coming down it. Not knowing the other car is coming down, another car starts up. God sees everything so He sees that there is going to be an accident. Though His heavenly power, He could stop it – but the two cars come around a curve and collide. Why didn’t He stop it? The answer: It is God’s will. Why, we do not understand, but God has a reason for flowers growing, beautiful sunshine days, car accidents, people dying and more. What a horrible thing to have happen to anyone. I can not begin to know the pain they all feel. The Amish are so to at forgiving and we need to be more like them I know that can be very hard though. My thoughts & prayers go up for both sides. 1. Forgiveness helps the pain..
3. Also, Forgiving yourself.. eventually… Takes time! Taking A life is just as horrific..
From the article, the neighbour’s name appears to be Randy Wagler, rather than David. Thanks for catching that RC. Just fixed it.